"Won't You Tell Me the Gospel Story?" --a Long-Standing Call and Challenge to 21st Century Stadem Descendants based on Josh McDowell's klaxon blasting call to us sleeping, complacent 21st century Christians to "catch up" to what is going on with the Fourth Generation or face disaster. Josh McDowell, and others who have surveyed the spiritual health of the present churches and the Christian youth in them, are right that we are losing these youth, due to the change in mindsets and world-views going on. I can see it myself with my own eyes. We are definitely losing the Sixth Generation, since my own Fifth generation (starting with Sjur and Oline as the First Generation) has failed so far to carry and pass the Torch of Faith passed to us by the faithful, mostly departed Fourth Generation (which included Myrtle and Bill Svanoe, Pearl and Bob Ginther, Bernice and Russell Schaefer, Tom and Ruth Harrington, Estelle and Joseph Rangen, Alida and Hans Spilde, Art Stadem). The young people do not see things as our generation did. It is unlike any previous generation. How? They do not see or accept absolutes, they see only negotiables and options and relative values. Without absolutes, everything of our historic, bedrock Christian faith is up for negotiation, compromise and change, and even rejection if something else comes along that proves to them to be more attractive or trendy. They go on emotions, not reasoning based on absolutes and biblical principles. That makes all the difference, as the world is not based on feelings and relative values, it is based on God's immutable laws and principles. These young people are so mistaken: they go by their changeable feelings, not by non-negotiable core beliefs in absolute truths as we of the Third Generation have done (more or less, and probably more "less" than "more"!). The "Sixers" will "negotiate" the Cross, that is, water down and redefine the Work of Christ done for their salvation and settle for something else that has more politically correct meaning, perhaps, but it will be a false gospel that cannot save their souls. They may be saved and born again, but there is indication they will give it up, when they find something less demanding on them, perhaps, something that is more acceptable to the popular culture and to their friends, and you know that "something" will probably come their way to lead them off from the flock of God. That is the way of the world when it comes to the Church, isn't it? We see this trend in Judges, and it continues to this day. This fatal decline to apostasy and perdition and total compromise from a good start with Bible-based people, a decline back into living just like the fallen world and the lost people in it, can be reversed. But we of the Sardis-Churched, Fifth Generation must take a good, hard, long look in the mirror, spiritually. We must confess to God where we have missed the mark, and not run from the challenge nor the shocking evidence of decline, denying it and our part in hastening it. We must at the same time stop assuring ourselves it will all work out somehow (which it won't, we are only avoiding the responsibility of making ourselves part of the change needed to turn things around!). Can we face ourselves and repent and do what is necessary to save what little is left, as Christ challenged the dead church of worldly, compromised, self-centered, affluent Sardis? It is our choice. The Lord have mercy on us! It is time to change. "To a large extent, the American church has become merged with the lost, immoral, godless world. It has adoped so many of the world's ideals and standards that it has lost its ability to stem the tide of crime, deception and immorality that is sweeping the nation. For millions of church members there is no deep commitment to the cause of Christ, no regularity of attendance at public worshi9p, no sacrificial giving, no personal religious discipline. Evangelist Ken Ham has also authored the book, "Gone Away," telling of the younger generation who are fleeing the churches at record numbers. Why? Primarily, it is hypocrisy--the younger people see that their elders and even their parents do not really believe what they say they uphold in church. This drives the younger people away from the churches and also God--soon as they get the chance to leave home and the rules and scrutiny and discipline of their parents. In the same issue of the Billy Graham article (which we quoted above), appears a very timely article by the award-winning fiction author Ann Tatlock called, "Cultivating Honest in a World of Deceit." She defines and speaks of "the postmodern lie" that there is no absolute truth. The doctrine of relativism has taken the place of absolute truth. Consequently, there can be no moral standard for those who deny absolute truth. No wonder the students polled in the public schools say it is okay to lie and cheat! She says "Truth cannot be constructed according to the whims of individuals [who deny absolute truths and moral standards based on them exist]. Rather, it's revealed by God through His Word and through the incarnation of His Word, Jesus Christ." I plan to follow this up with Atle Svanoe's book, re-published in English from the Norwegian language by Rennard Svanoe, a grandson of Atle Svanoe. I will be giving excerpts from the book at least, so that all of us can face what he has to say about the Sardis church as applied to believers in Christ. He wrote at the turn of the last century, but it is all the more true to our condition and plight today, you will certainly find out if you take the time to read the portions shared here hopefully soon! CAN RELATIVES BE "RELATED" AND YET NOT BE REAL FRIENDS? there's a special place for friends. until you give some of you. IF THERE WAS EVER A WOMAN OF PRAYER, IT WAS GRANDMA BERGIT STADEM! Would go to church on her own two feet! And wish she lived here yet! And yet she also knew some pain. But on she went, no duty shied. And then the fire, unhappy day! But Grandma said, "It is God's way." Oh, what a glorious way to live! For Lee, or Chet, or anyone. I'll remember all my days. May your life always be of good cheer." 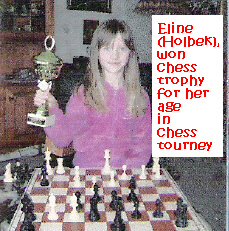 Their granddaughter won the chess trophy for her age at a Norwegian chess tournament in 2010! 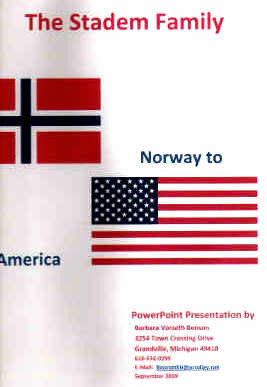 Other Norwegian news: Aglow International held a conference June 3-4 in Alta, Norway, right on the border, with delegates from Russia meeting with delegates from Norway. 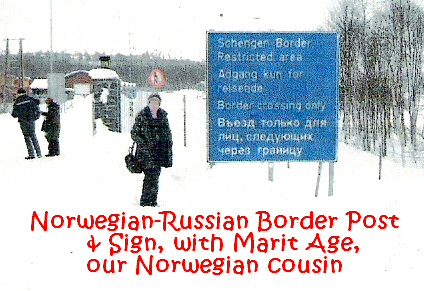 Here is a picture of the border sign with Marit Holbek Age standing by it--this is way above the Arctic Circle, by the way!I am sure the Christian ladies, on fire for the Lord, prayed for both countries, Norway and Russia. Norway is religious, with a state church, but yet the authorities in Oslo are working to stop all evangelism and street preaching--surely not a good sign for Norway's progress in the future. Norway is long due for revival, ever since the revivals of Hans Christian Hauge revitalized thousands of individuals with salvation and in turn these revitalized the dead and formal churches. 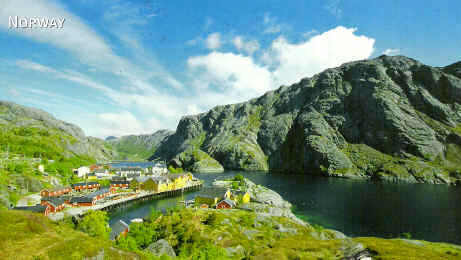 Now Norway desperately needs a return of the same! Please go to the republished short biography of Hans Christian Hauge when it comes on-line and we provide a link to it here on this page. 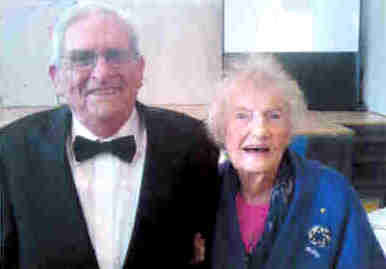 Two Centenarians and Lifelong Family Friends and Members of the Same Church, Pearl Ginther and Levere Gray, meet at Church! WHY BOTHER ABOUT OLD-FASHIONED HERITAGE? WHAT GOOD IS IT ANYWAY? WHY NOT LET THE POPULAR CULTURE DEFINE WHO WE ARE AND FORGET ALL ABOUT WHAT OUR STADEM FAMILY FOUNDERS DREAMED AND ACCOMPLISHED? "You show me someone who doesn't know where he's been,and I'll show you someone who doesn't know where he's going." Loved One, doesn't that say it in just a few words? The Stadem Families cookbook in progress: It is called: "The Flavor of Plain View Farm, Pearl's Norsk Cookbook." We are working on computer with Typensave, a wonderful CD format furnished free by Morris Press Cookbook of Kearny, Nebraska. If you have a favorite recipe, and especially one that is Norwegian or Scandinavian, please send it to us by email or by snail mail. You can send snail mail to: Ron Ginther, 10709 63rd St. E., Sp. 28, Puyallup, WA 98372. Categories or sections for recipes are: 1. Appetizers and Beverages; 2. Soups and Salads; 3. Vegetables and Side Dishes; 4. Main Dishes; 5. Breads and Rolls; 6. Desserts; 7. Cookies and Candies; 8. This and That. We will be very grateful for any submission or help you can give. This is being done for everyone's benefit. To illustrate the cover and also the section pages, we are going to include photos of the Farm and Loved Ones, so that is a family keepsake as well as a working cookbook. A CD that contains the recipes will be included with the book when it is printed for those who request it. The book will be inexpensive, somewhere around $10, and the CD recipes will be about $3. What a great gift it will make too at any time of year, for birthdays, anniversaries, Christmas, etc. If you could let us know in advance how many copies you want to order, that would help us estimate how many to print, which we need to know in advance to inform Morris Press. We pray that this will be a blessing to body, soul, heart and spirit! It will be all that, with God's help, and yours too! 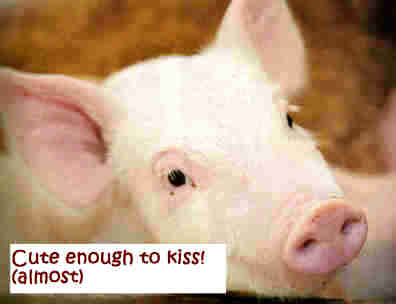 "The Flavor of Plain View Farm, A Norsk Cookbook"
Want to lighten up a bit? How about a few good, clean Norskie jokes? They come cheap maybe, but, hey, the best things in life are still free: air, sunshine, a baby's smile, a mother's love, a handshake from a friend, the gift of salvation through Jesus Christ topping them all. So get ready for a healthy chuckle or even a belly laugh! What was Plain View Farm like at the beginning? Think open, virgin prairie, no trees to speak of, just the wind sweeping over the grassy hills and vales, wind-swept, flower-filled grass that stood as high as a horse's saddle. All this vast and nameless wilderness Ole Rolvaag, the great Norwegian author immortalized in his classic epic, "Giants in the Earth." 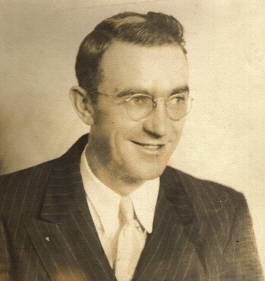 Ole Rolvaag in fact attended the same school in Canton, SD, as the Stadems, Augustana College and later called Augustana Academy after the College part relocated to Sioux Falls. He said that when the wind blew it made the saddle-high prairie grass make the sound "Tisha!". This great prairie was a kingdom of grass and wild flowers roamed by buffalo, coyotes, wolves, rabbits and deer and other animals. There was no Farm visible at all--it had to be started "by scratch," a mountain of "by scratch"! But after that initial phase was concluded, this was the way things looked in the earliest days, so you can see there was a lot of change and improvement, largely produced not by happenstance and "luck" but by hard work and much love and even some tears and laughter--not to mention, God's blessing, year after year, to bring things to fruition. Also sizzling hot off the griddle! Estelle Stadem Rangen's account, "The Stadem Heritage." Please look for it here. DO YOU MIND IF WE ASK YOU A QUESTION? Here it is: "What is it that we have as Stadem descendants that we want most to preserve and pass on to the younger generation, as well as share with people everywhere?" Pearl Ginther and her son Ronald (Number 4 Son, and 5th in the family) sat down not long ago at the kitchen table and came up with a four-part answer to the great question, and when sharing it with a Stadem cousin from California, another part was added to enhance what they had put together. Interested to find out what their answer is to the big question? You can compare it with your own then. Along this line of recognizing our heritage and it values and passing them on to the younger generation, we are sharing Dean Stadem's letter to us that gives valuable information about the Stadems, which you may not know, particularly about the "First Wave" of Stadems that arrive by ship via Hudson's Bay in 1793! At last! The weather was perfect, after a many rainy days all spring. God picked the perfect day for it. No doubt about it! 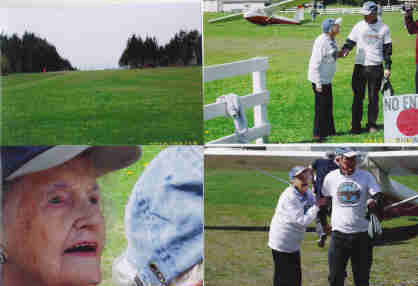 Pearl Ginther took her glider trip on Sunday, after waiting 10 years and 7 months and prayng for it, and her son Wayne was the pilot! 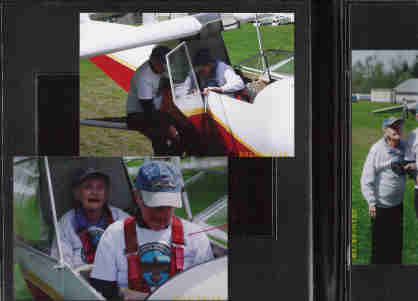 Want to see the latest glider pictures hot off the press? PRAISE TO GOD OUR WONDERFUL PROVIDER: JOHN MORRELL COMPANIES SENT A CHECK TO PEARL GINTHER FOR $1,000 AS A CONTRIBUTION TO THE HERITAGE CENTER AT PLAIN VIEW FARM IN MEMORY OF ROBERT GINTHER, PEARL'S HUSBAND WHO WORKED AT MORRELLS! We have available on this site new illustrations for nine of Pearl's latest Stories of Plain View Farm. Here ae five of six of the nine. You may like to copy off the stories and these illustrations and make up your own children's book for your children, grandchildren, and even great-grandchildren! We have sent out too copies of the book already, but for lack of time we cannot do more than this. But you can easily make a copy yourself if you have a printer. Have fun! 1. "How Pearl Found Honey for the Family"
2. 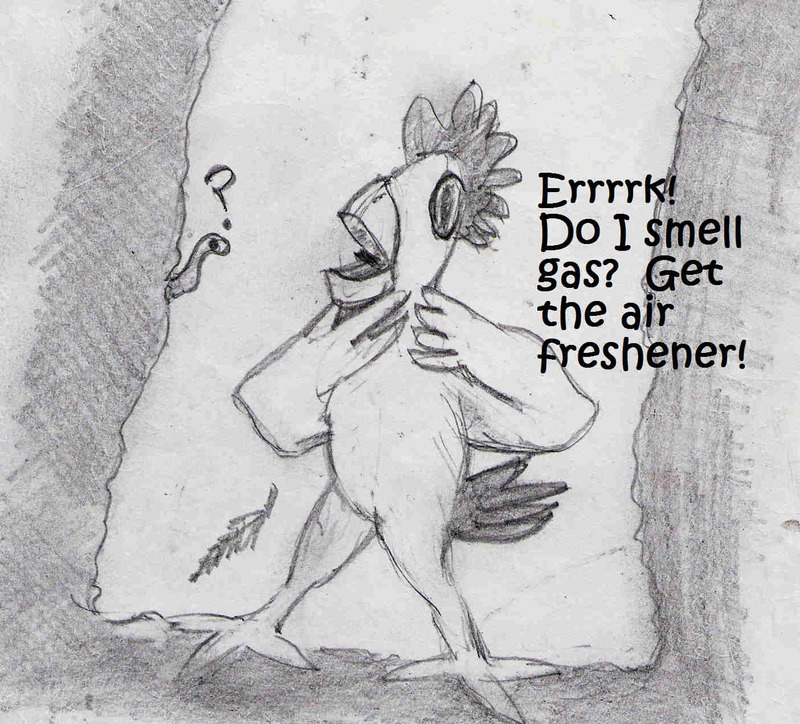 "Rooster in the Well"
3. "How Pearl Got Home in the Dark"
4. 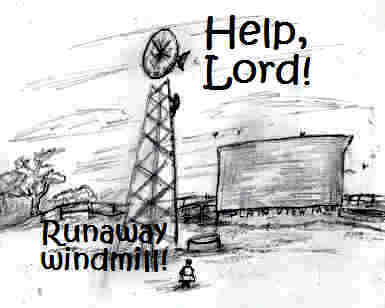 "How Pearl Stopped a Runaway Windmill"
5. "How God Provided Pearl Popcorn"
6. "How Pearl and Her Mama Made Ice Cream"
7. 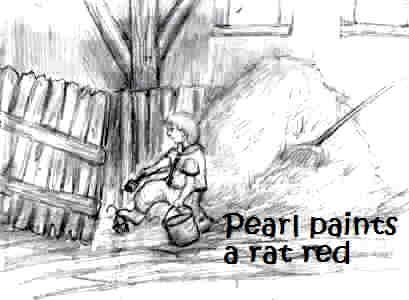 "How Little Pearl Got Rid of Rats on the Farm"
8. 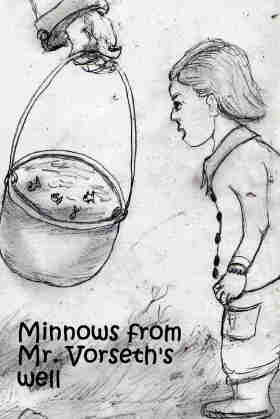 "How Pearl Got Minnows for Papa's Pool"
9. "How My Horse, King, Got the Wrong Message!" One year Pearl Ginther exhibited her willow ware at the Western Washington State Fair, one of the biggest in the country. It was the only such collection of Blue Willow Ware at that Fair exhibition for that year. 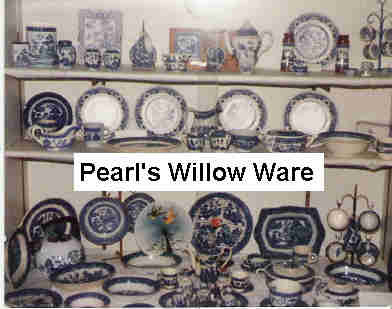 Since it is Blue Willow Ware, she should have gotten a blue ribbon, right? She has collected for many years, and slowed down in that effort, but the items are still hers to donate to the Heritage Center at PVF when the time comes. 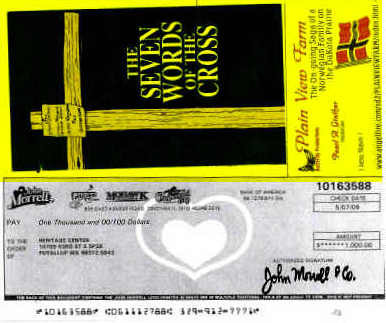 These items, a Gospel Tract & Pearl's Card for the Plain View Farm Website, are put with the wonderful check from John Morrells for a good reason: The Gospel of the Saving Grace of Jesus Dying on the Cross for us sinners, and our cherished Scandinavian heritage--those two things make us what we are and give us our golden heritage that we are called to share with the world. God bless John Morrell Companies for their warm support of American heartland values along with our Scandinavian heritage and the saving Gospel of Jesus Christ! 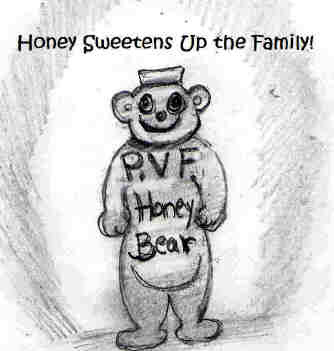 With this latest contribution, which is a miracle from God of provision, there is more than sufficient funds (in May 2009, $14,700+) to start the construction on PVF (as confirmed by Steve Stadem, Heritage Center Project supervisor), donated since Pearl began the funding drive in August 2008, and we are into the second year, with steam building in the Stadem families' boiler! "Giving is living," the angel said to me. "Go feed the hungry sweet charity's bread." "And must I keep giving and giving again?" my selfish and querulous question ran. "Oh, no," replied the angel, his eyes pierced me through. "Just give until the Master stops giving to you." Pearl says she is so happy to see this wonderful project blossom as it is doing, as she thinks of her beloved parents, Alfred and Bergit Stadem of Plain View Farm, and thinks how very happy they would be to see it too. A grand future with much sharing and ministry and plain, old-fashioned fun and fellowship, indeed, is assured for Plain View Farm's heritage as the shining torch is handed to the younger generation in this most meaningful way. Bryant and the whole area will be richly blessed, there is no doubt. 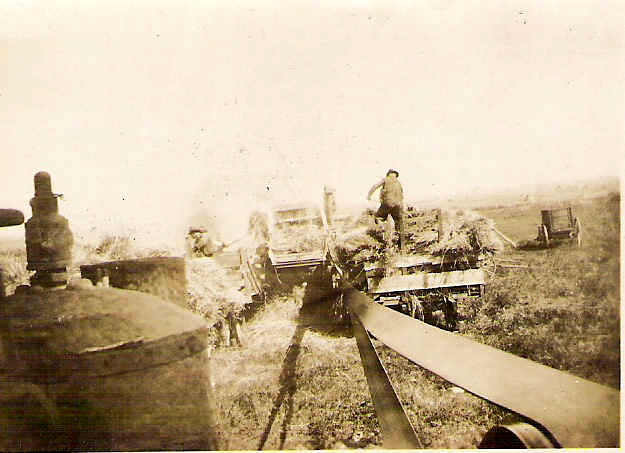 --Contributed by Ronald Ginther, son of Pearl A. Ginther"
"Our Vision for the Future"
PLAIN VIEW FARM COOKBOOK IN THE MAKING! Ron Ginther and his mother and sisters are going ahead with a cookbook for Plain View Farm, tentatively titled, "The Flavor of Plain View Farm." It will feature Scandinavian dishes and foods and culture, and a farm setting too. We have "guess-timated" 135 recipes in the following sections, and will receive a book kit from Morris Press Cook Books of Nebraska. We have a sample copy of a Morris cook book to work with before the kit arrives. We will feature recipes from the Stadems. We have some already from Mama Bergit Stadem, Bernice, and Myrtle. We will need some from other family members if descendants will share them with us. We are asking them to, via this home page, and through the Samtaleren too. The cost will be paid by us, but we are looking to sell the 150 copies we have "guess-timated" we will order made, and the proceeds will go to the PVF Heritage Center fund and also to missions. 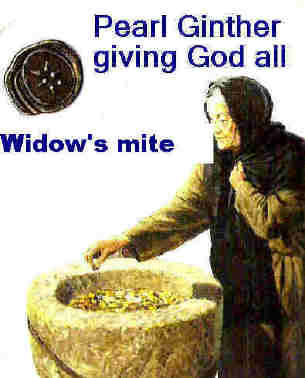 [She first prophesied that God would multiply a particular money gift given to $100,000]. We will continue to work on the house and dream big things for the farm, the barn and all its outbuildings, and after the Lord has restored and rebuilt, until the last brick is in place and the last nail drive in then will the glory of the Lord fill the house and there will be rejoicing that can be heard all the way to Bryant. Yes, I see the vision for the Heritage farm. A place of meeting, remembrance but more than that a place of blessing, and a harvest of souls. I love you Ronnie, you are a spokesman for what is good." [My thanks and gratitude go to Cousin Naomi! With Christ's help, guidance, and strength, I truly hope from the bottom of my heart to be someday that "spokesman of what is good."--Ed.]. A FASCINATING FARM TIP: WANT PAINT THAT WON'T FADE AND WILL LAST HUNDREDS OF YEARS ON YOUR HOUSE OR BARN? "The Power of Milk Paint"
Want to take a gander at some of the Stadems? Go to the Stadem Family Album which is a gallery of the Stadems from the earliest days! Did you know the First Wave of Stadems came by boat over to North America in 1793, wintering in Winnepeg, Canada, then settling in what later became North Dakota Territory? Please read Cousin Dean Stadem's letter which tells of this epic voyage and journey. 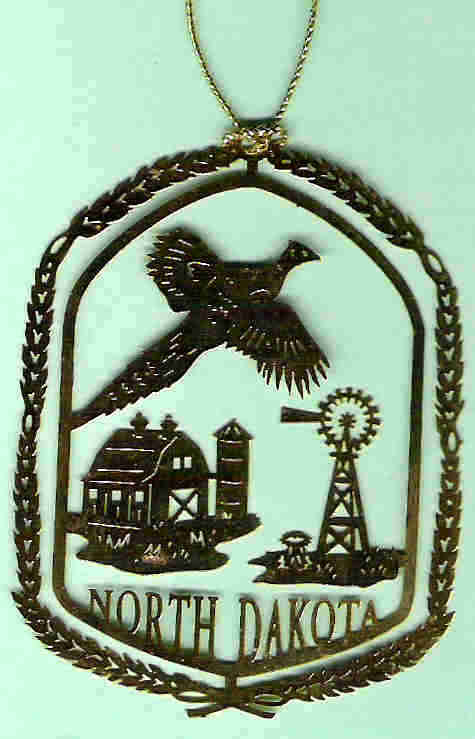 For 75 years they lived in North Dakota Territory, then they moved south to many other states where they are today. We must do a lot of hard work to reset the links on the Album pages, which will take considerable time. Please bear with us in the interim. 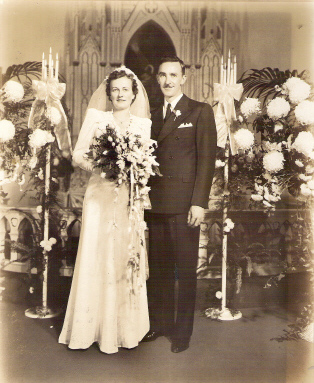 But here are a couple pictures never before seen, of Axel and Hazel Lundring's wedding photo, of Axel Holbek Lundring. 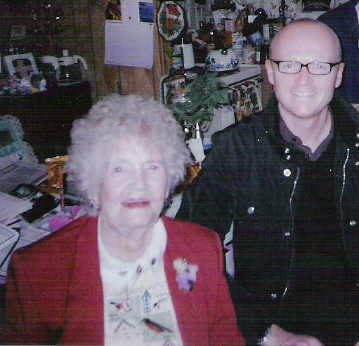 His saintly mother is Katrine Holbek (Holbeck) who emigrated in 1903 on board the Hellig Olav steamship from Kristiana (Oslo), Norway. In changing over to our own domain, we lost a hundred or more links,and have yet to find time to revise them! Sorry for the long delay in this work with the Photo Album! 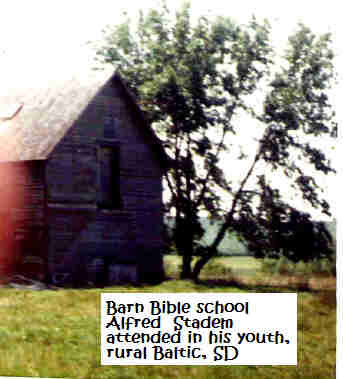 The old farm it's a grand, grand place: Faith was nurtured here. Around this table with all these chairs: Grace and Love held dear. There was work to be done with the rising of the sun: Everyone chipped in. they were saved from their sin. They were taught on this prairie in the U S of A, Jesus in Plain View. And with the life that was led and the fruit they were fed, sacred words rang true. And when they sat down to pray it's certain they would say: "Thank you, Lord, for this life. in this world of stress and strife. See God's handiwork, it's all around. In the beauty of the earth, it's found. Jesus' blood set us free; unbound. Let his praises now resound. Well, some are gone and some still remain, but they'll all be together someday. For the promise that was made by the light that doesn't fade, came and showed the way. We can be there too; it's not just for a few. He came to save us all. Are your heartstrings touched touched deeply by Steve's heartfelt song, dear friend of Plain View Farm? 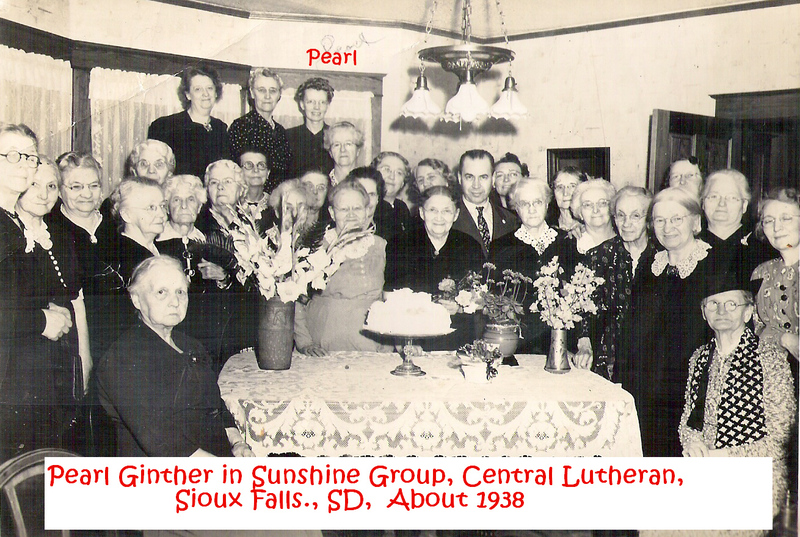 Do you wish to join Pearl Andrina Stadem Ginther and the Stadem Relationship families to see this Heritage Center become a glowing reality? NOW IS THE TIME FOR YOU TO SHARE IN THE BLESSING BY GIVING TO IT! We shall see Almighty God come through, as we already have faith for it, and some of the money. We have more than enough to start, but not yet enough to finish it. I estimate that we will need at least $100,000, and we are believing God for someone to contribute most or all of that amount--having already prayed for it, Stadem Families Matriarch Pearl Ginther leading the prayer. 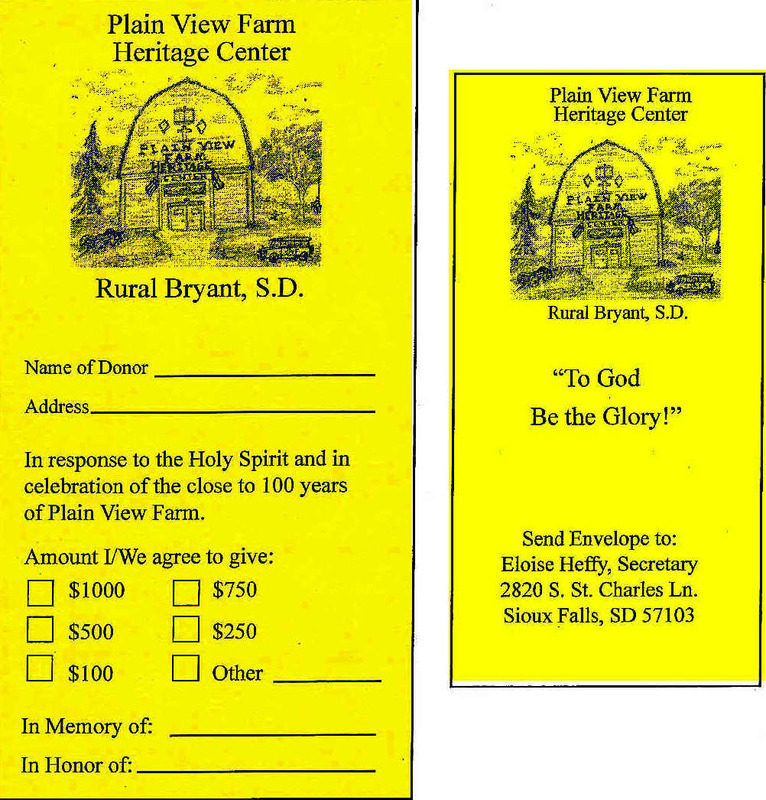 You can contribute in honor of, or in memory of, a loved one, or just make a contribution for the sake of preserving pioneer immigrant farm heritage that actually began in a sod house in Dakota territorial days only a few miles from Plain View Farm! We have prepared a Certificate, suitable for framing, that will be your momento of your gift. We have posted a picture of it on this page so you can see what you will receive, signed by Pearl Stadem-Ginther and PVF Secretary, Eloise, in gratefulness for your gift to the Heritage Center. 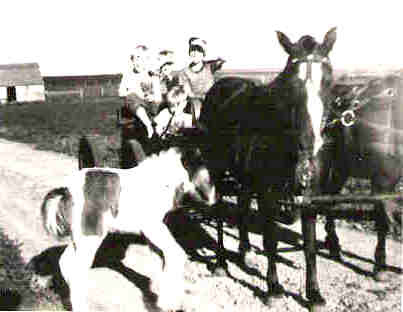 As the popular TV series about a Scandinavian family, "I Remember Mama," demonstrated, the mainstream of Americans can identify with the Stadem pioneer experience, as they all confronted the same challenges and tests and eventual triumphs on the same Prairies as you see in rural Bryant, where the Farmstead is located. There is another film of Scandinavians in America called "Mama," which I have not seen but which is recommended to you by Stadem descendants who have seen it. This truly golden heritage, which contains the precious core values of America in their fullest expression--love of God, love of freedom, love of country, love of church, love of godly Christian lifestyles, love of the Bible, love of family, love of friends and neighbors and community, and great emphasis on education, hard work and self-improvement, community development, cultural advance, and loads and loads of fun and food and fellowship, all flourishing here at Plain View Farm, and are still very much alive and celebrated. Come, join the celebration of the very things that made America great! Contribute whatever you can toward this worthy project of the Plain View Farm Heritage Center. "Is There a Cross on Plain View Farm?" where sinners can find a cure for sin? with Balm of Gilead for life's wounds within? come not to improve but to save. a whole society chose Bar-abas, and put on a fancy show. They didn't want Him then, are we different today? 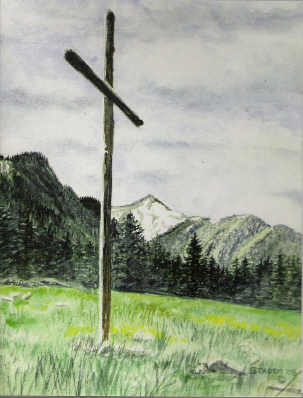 Yes, there is a cross now on Plain View Farm, erected June 2016 during the reunion. We know that it was erected, but was it a spiritual reality, or a mere decoration? Time will tell. We do hope and pray that many will fall at the foot of this cross and seek God, His healing touch, his forgiveness, his transformation of the human heart and life into a worthy vessel, or at leas the start of one, that will bring glory to Him and His kingdom. Again, time will tell.--Ed. NOW HERE IS BERNICE SCHAEFER'S "AT THE OLD HOME PLACE," HER REMINISCENCES OF THE REUNION OF 1986, WHEN THEY CELEBRATED THE GOLDEN WEDDING ANNIVERSARY OF MYRTLE AND BILL, AND THE HOMECOMING OF CORA AND CARL. 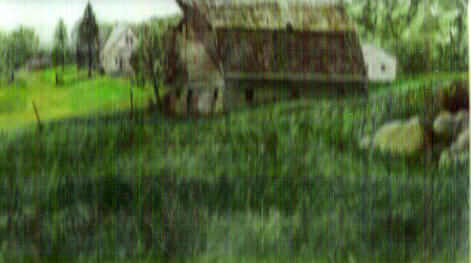 PETER STADEM WAS ALSO A'COURTIN' HIS TRUE LOVE, AND THE OLD FARM WAS A BEAUTIFUL SETTING FOR THEIR GROWING ROMANCE, INDEED. THIS WILL REVIVE OLD MEMORIES AND YOUR LOVE AND JOY OF FELLOWSHIP WITH LOVED ONES, WHICH CAN HAPPEN AGAIN, EVEN IF YOU ARE NOT ABLE TO COME, IF YOU WILL GIVE NOW TO MAKE IT POSSIBLE FOR OTHERS. Why give memorials to a Heritage Center? Here are some reasons we can think of, scriptural and also from our cultural inheritance over the ages. CALLING ALL WOOD CARVERS AND WHITTLERS AND CARPENTERS! We need you as volunteers to carve the beautiful, interwined Norwegian acanthus leaves and other traditional Norwegian motifs on the Heritage Center. 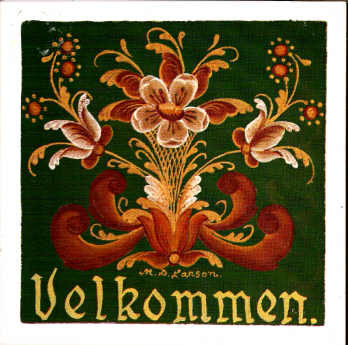 "VELKOMMEN" or, Welcome!!! in Norwegian is rendered here with Rosemaling. What is "Rosemaling"? 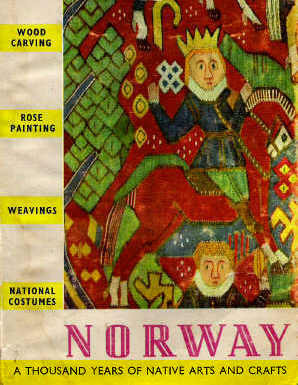 With comparison to the beautiful Mallorica tile designs from islands in the Mediterranean (an art form that the Vikings surely saw, as they sailed that sea early on to raid and trade), Rosemaling is a beautiful, traditional Norwegian folk art that originated and developed in the rural culture of Norway during the 18th and 19th centuries. It had its beginnings in Norway's small, green valleys where it was used as a form of interior decoration on walls, ceilings, trunks, bridal trousseau trunks, and other items in the rural home. It served to brighten up the home's interiors considerably during the long winters of Northern sunlessness. 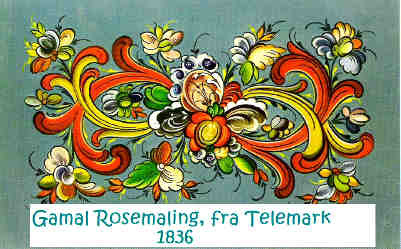 Each district developed its own style of rosemaling with that from Telemark and Hallingdal districts becoming the most highly developed and enduring. These various styles have been passed down through generations of painters, thus preserving this unique art in its most original and traditional form. With it flowing scrolls and flowers, rosemaling is recognized as one of the most sophisticated and mature forms of decorative painting. Preserving this art form so all may enjoy and share its beauty is one of our purposes at the Plain View Farm Heritage Center. We will have classes in rosemaling to train new artists in this wonderful Norwegian art. PLEASE WRITE TO US, BETTER YET COME IN PERSON, DEAR HOLBEKS AND STADEMS IN NORWAY! OUR FIRST HOLBECK RELATION, COUSIN RUNE HOLBEK FROM THE MANDAL AREA, HAS JUST COME TO VISIT US, IN FACT, AS THIS PICTURE PROVES. 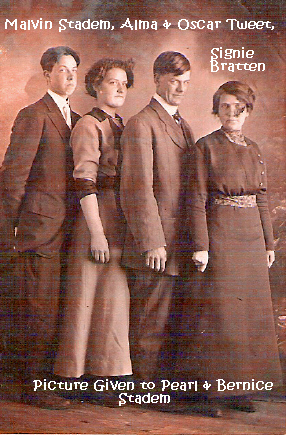 SEE ANY FAMILY RESEMBLANCES IN THIS PICTURE? COUSIN RUNE HOLBEK WAS ALONG WITH HIS FAMILY A BELOVED GUEST AT THE GRAND CENTENNIAL BIRTHDAY CELEBRATION OF HIS COUSIN PEARL GINTHER. SEPT. 2009. THEY ARE WELCOME BACK TOO! HUNDREDS OF PICTURES (320) WERE TAKEN BY A PROFESSIONAL PHOTOGRAPHER, Mr. DAREL ROA, OF WHICH SOME WILL BE SHARED HERE, WE HOPE, IN THE NEAR FUTURE. THEY CAN BE ORDERED FROM MR. ROA AS WELL BY GOING TO www.darelroaphotograhy.com. 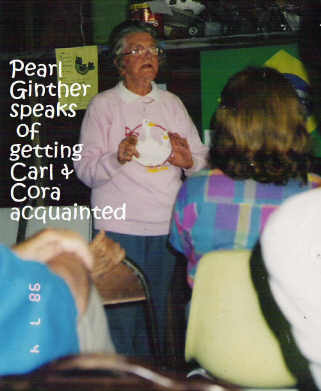 YOU WILL FIND PEARL GINTHER FEATURED, AND BE GIVEN INSTRUCTIONS HOW TO ORDER HER PICTURES. 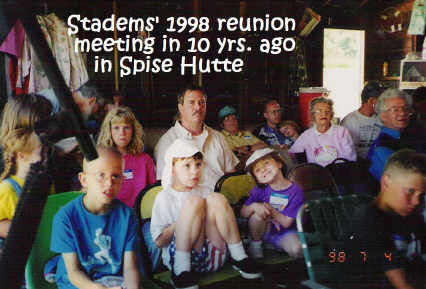 ALSO, RUNE AND HIS FAMILY, ALONG WITH COUSINS ARNE AND MARIT AGE-HOLBEK WERE WELCOMED TO THE FAMILY REUNION OF THE HOLBEK-STADEMS AT THE FARMSTEAD IN SOUTH DAKOTA. IT WAS A WONDERFUL REUNION WITH THEM AT THE BIRTHDAY IN WASHINGTON STATE, BUT WE HOPE THERE WILL BE MORE CONTACT IN THE NEAR FUTURE. AND WE NOT ONLY HOPE, WE EXPECT IT TO HAPPEN! 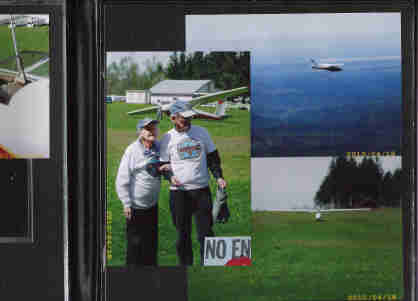 SEVEN Holbeks flew from Norway to join in the celebration of Pearl Ginther (a Holbek and Stadem descendant, only one generation removed from Norway). And how about ALL you beautiful, precious Stadems over in Norway? You are presently being outdone by the Holbeks down in the south part round Mandal! But time hasn't run out for you yet. You can still come and join in. 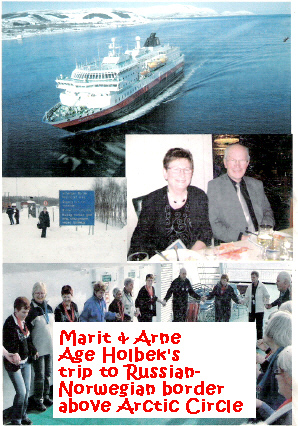 Please, all you dear loved ones residing in our ancestral Holbeck-Stadem homeland of Norway, let us hear from our related Stadems and Holbecks--a card, a letter of support, would be a grand thing--something to read out at the dedication of the Heritage Center next reunion of 2010. Come to fellowship and get loved on! Relax and enjoy yourselves in a beautiful, prairie farm setting. And if you like a little exercise too, you can volunteer your labor and help build, or finish the Heritage Center interior facilities (plumbing, electrical, etc), or even can try your hand carving Norwegian style on the posts and door frames, you may contact the Plain View Farm project manager, Steve Stadem. Above all, pray for this project, that it go forward SPEEDILY, so that the eldest Stadem daughter AGED 100 will be able to set her dainty foot in it at the grand dedication this coming July 2010 and give glory to God in her dedicatory words and prayer! This is her golden dream, and this our own golden opportunity. There will not be a better time than this time--you can be sure of that, considering the condition of this world and in this country! You can make it a shining reality, with prayer, with actual funds, and with construction abilities, with support, however you can help out (as this is a community project, not just a Stadem family endeavor, which will reach out to bless the entire community of Bryant and the surrounding state and the world). Pearl Stadem Ginther says: "I want to see the barn heritage center go forward! It is a real necessity. It is on my heart so strongly. I want to see it done before I am 100. [in prayer] Mama and Papa would be so joyful, and even get in on it in heaven perhaps. To see souls saved! Nothing is impossible with God!" "Everybody needs a husband or a wife because you can't blame everything on the government." "Two women met. One wore a floor-length mink. The mink-less lady very irately said to the other, 'How many poor, defenceless creatures had to die to give you that fur coat?' The other replied, 'My Aunt Inga.'" "Where a man ends up with a nest egg or a goose egg depends on the chick he married." "Soft judges made hardened criminals." Barbara Vorseth Benson's new Stadem Family book is ready to bless you and your family! 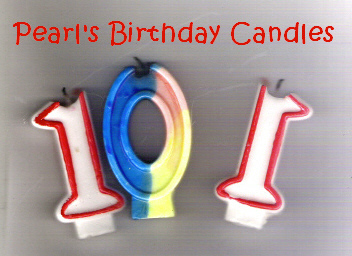 Email her at BvorsethB@prodigy.net and place your order(s) with her, including your address. Contains history and unique pictures, a supplement to the larger Stadem Genealogy book of hers. Cost of the new book to be printed and sent to you, is $25. Attractive enough for a coffee table! Don't be surprised if you see it offered again on this page, for we want you to be blessed! The Stadem Genealogy Book is still $10.00, but please include an amount for her shipping and handling along with your own personal thank you! You will be blessed, as this is a labor of love on her part to all the Stadems, and she is not getting anything else from it but whoever cares enough to write to thank her.